With our diabetes-management-software-SiDiary you can easily import data from your Simple Diagnostics CleverChoice AC 2in1 bloodglucose and -pressure meter and use lots of advantages of statistical analysis, trend analysis and graphics to improve your therapy together with your doctor. If you plan to replace your device to another blood glucose meter from Simple Diagnostics in the future, the data transfer from the aboved named devices are immediately available for you. 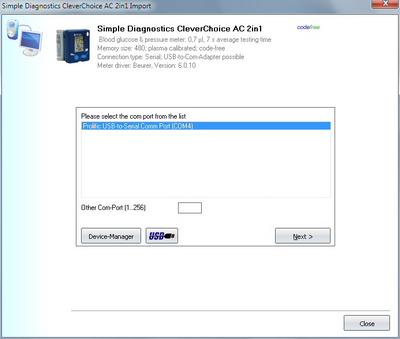 For the data import from Simple Diagnostics CleverChoice AC 2in1, a data cable is necessary. At this page you'll find more details directly from Simple Diagnostics.